Feodor was born in Moscow, the eldest surviving son of Tsar Alexis and Maria Miloslavskaya. In 1676, at the age of fifteen, he succeeded his father on the throne. He was endowed with a fine intellect and a noble disposition; he had received an excellent education at the hands of Simeon Polotsky, the most learned Slavonic monk of the day, knew Polish, and even possessed the unusual accomplishment of Latin; but, horribly disfigured and half paralyzed by a mysterious disease, supposed to be scurvy, he had been disabled from his birth. He spent most of his time with young nobles, Yazykov and Likhachov, who would later introduce the Russian court to Polish ceremonies, dress, and language. On 28 July 1680 he married a noblewoman Agaphia Simeonovna Grushevskaya (1663 – after 14 Jul 1681), daughter of Simeon Feodorovich Grushevsky and wife Maria Ivanovna Zaborovskaya, and assumed the sceptre. His native energy, though crippled, was not crushed by his terrible disabilities; and he soon showed that he was as thorough and devoted a reformer as a man incompetent to lead armies and obliged to issue his orders from his litter, or his bed-chamber, could possibly be. The atmosphere of the court ceased to be oppressive; the light of a new liberalism shone in the highest places; and the severity of the penal laws was considerably mitigated. He founded the academy of sciences in the Zaikonospassky monastery, where everything not expressly forbidden by the Orthodox church, including Slavonic, Greek, Latin and Polish, was to be taught by competent professors. The chief difference between the Fyodorean and the later Petrine reforms was that while the former were primarily, though not exclusively, for the benefit of the church, the latter were primarily for the benefit of the state. The most notable reform of Fyodor III, however, was the abolition in 1682, at the suggestion of Vasily Galitzine, of the system of mestnichestvo, or "place priority", which had paralyzed the whole civil and military administration of Muscovy for generations. Henceforth all appointments to the civil and military services were to be determined by merit and the will of the sovereign, while pedigree (nobility) books were to be destroyed. Fyodor's first consort, Agaphia Simeonovna Grushevskaya shared his progressive views. She was the first to advocate beard-shaving. On 11 July 1681, the Tsaritsa gave birth to her son, Tsarevich Ilya Fyodorovich, the expected heir to the throne. 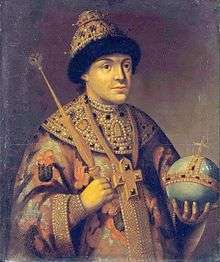 Agaphia died as a consequence of the childbirth three days later, on 14 July, and seven days later, on 21 July, the ten-days-old Tsarevich also died. Wikimedia Commons has media related to Feodor III of Russia. This article incorporates text from a publication now in the public domain: Chisholm, Hugh, ed. (1911). "Theodore (tsars)". Encyclopædia Britannica. 26 (11th ed.). Cambridge University Press.